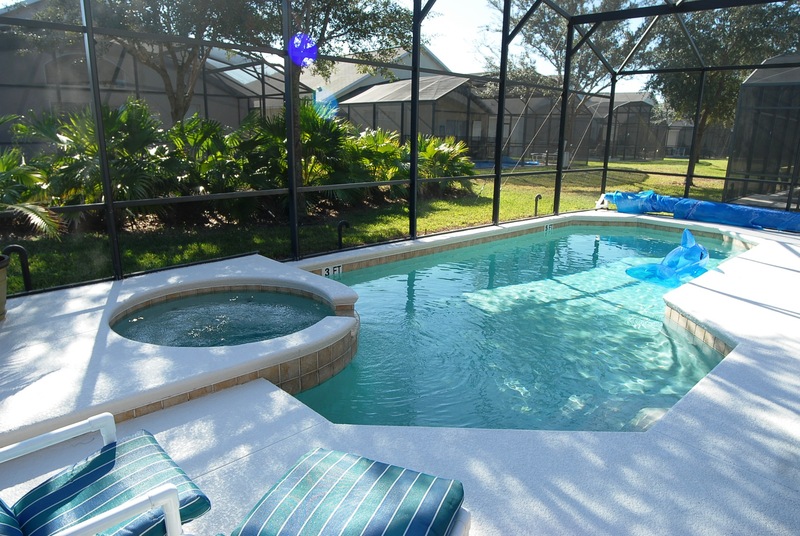 The large 14' x 30' heated pool accompanied by hot tub/spa and a covered full-width 10' lanai. 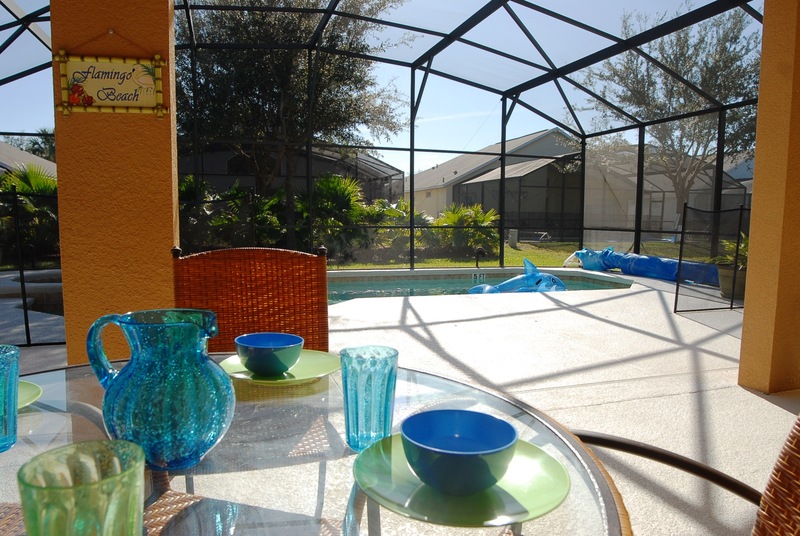 The pool is south-facing, which means the pool gets sunlight all day long and the lanai is shaded. There are plenty of loungers and chairs for all guests in the sun. 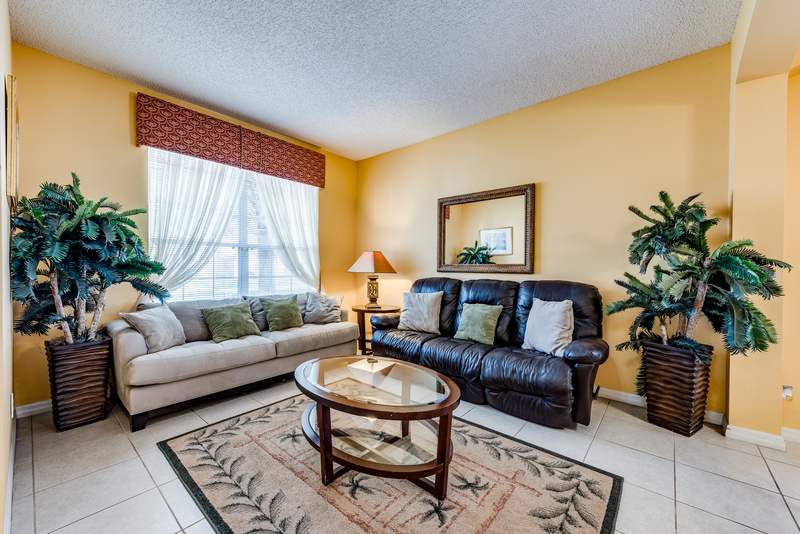 After getting enough tan, guests can rest under the shade of lanai which also has fans to cool you off. 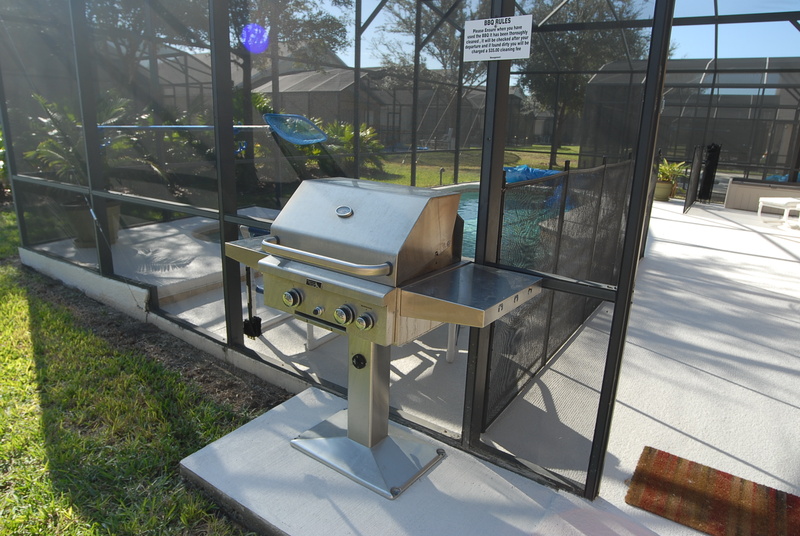 We also have a large gas barbecue grill and we provide free tank of gas. 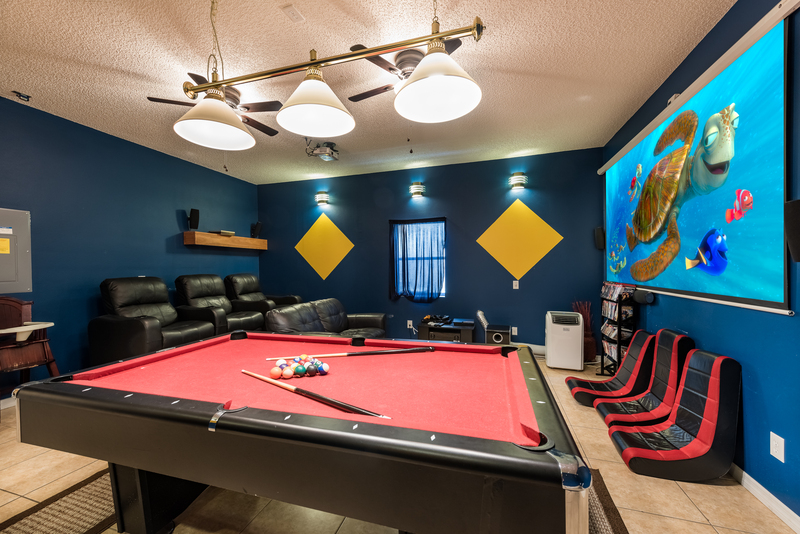 Our game room is fully air-conditioned and has a 7' slate bed pool table, foosball, and a DVD player. 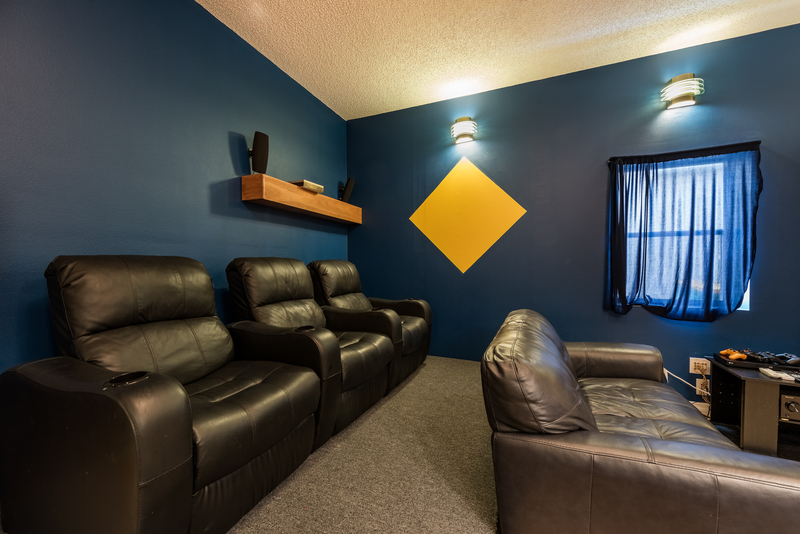 This room also has a 1080p projector that can be projected on to a 100"+ professional grade screen. We also have board games and a large collection of DVDs for all ages. 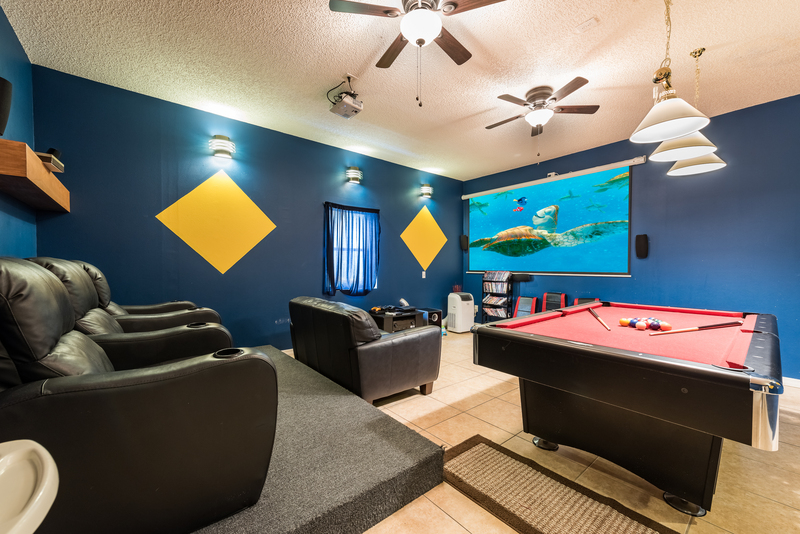 The The game-room is decorated to highest standards. 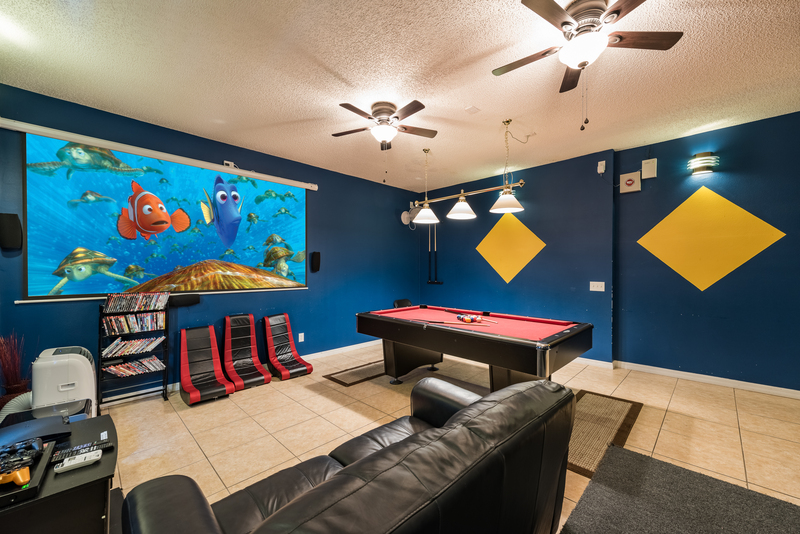 As always we say ..."If there is a garage door - it is a garage, not a games room!" - Photos to follow. 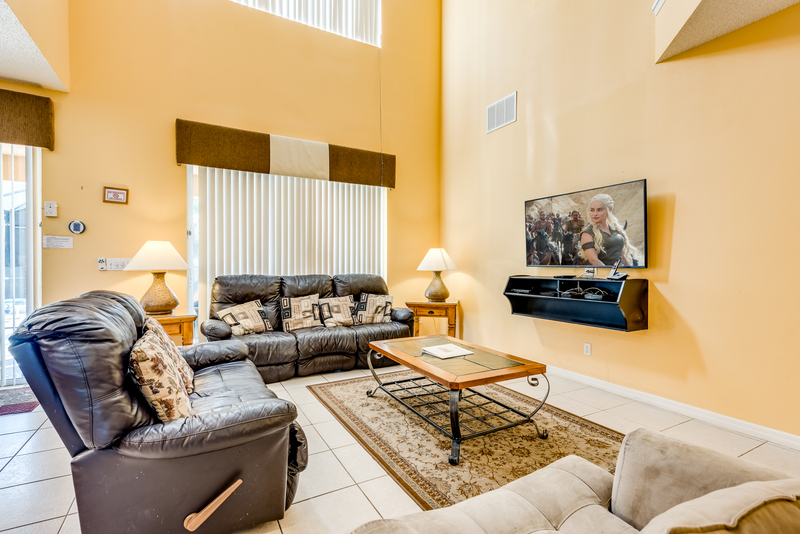 Living Room of our home is spacious, with a comfortable sofa, complemented by love seat, coffee table, and two end tables with lamps, 32” flat screen TV, DVD player, books, movie and game library, Playstation 2 and a CD player. 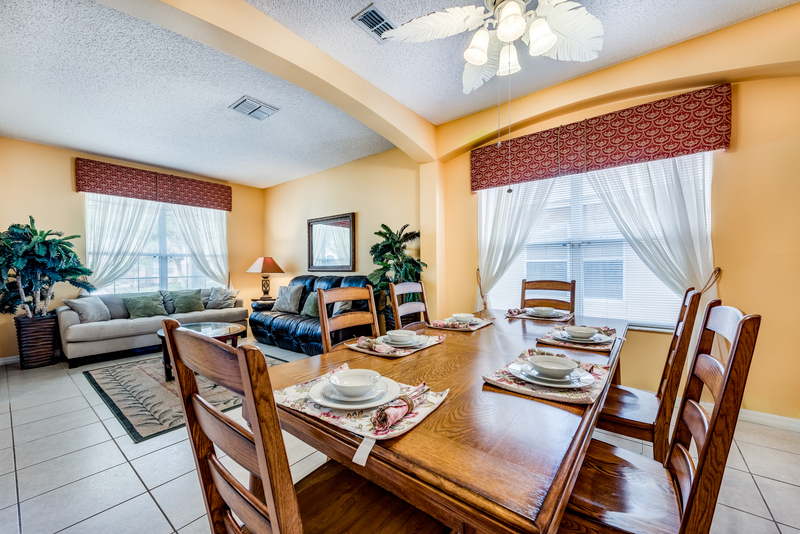 The Formal Dining is well furnished with a spacious dining table and six chairs with all place settings waiting for your gourmet meals to be served. 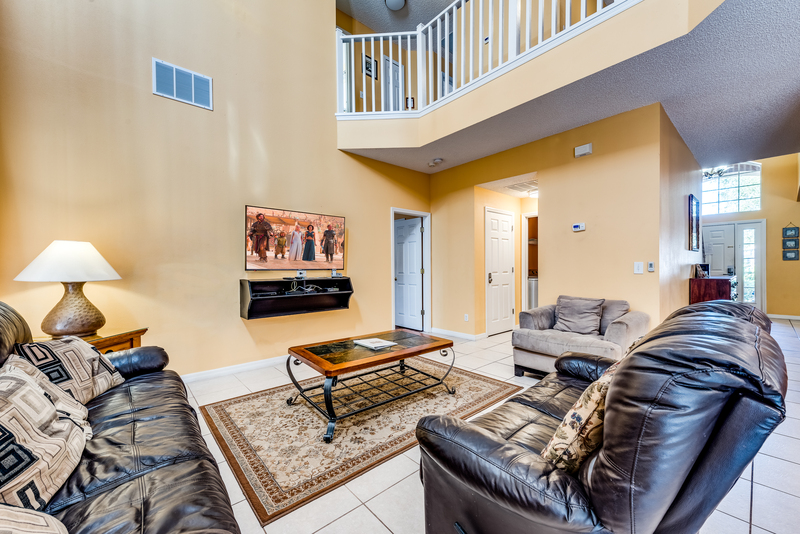 The family room with its two-story ceilings is spacious, with a comfortable sofa, complemented by loveseat, coffee table, and two end tables with lamps, 32” flat screen TV and DVD player. 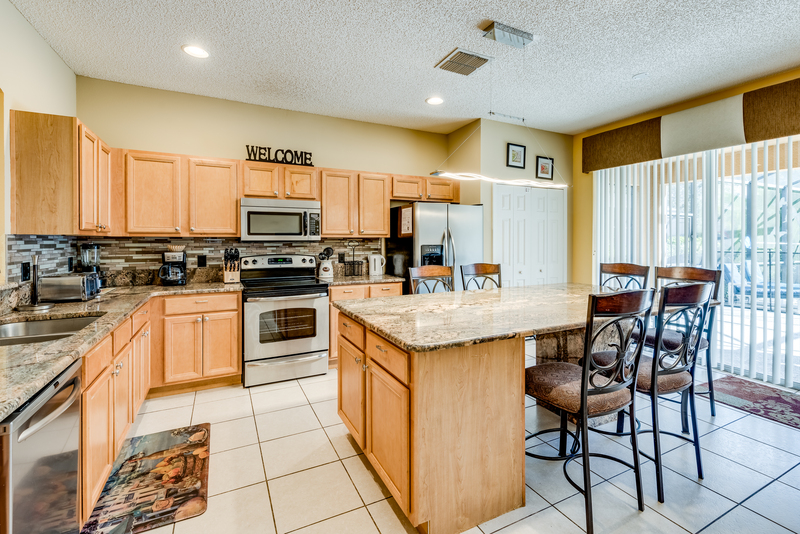 "Tropical Magic” has a well-equipped kitchen that makes food preparation a breeze while you are on vacation. 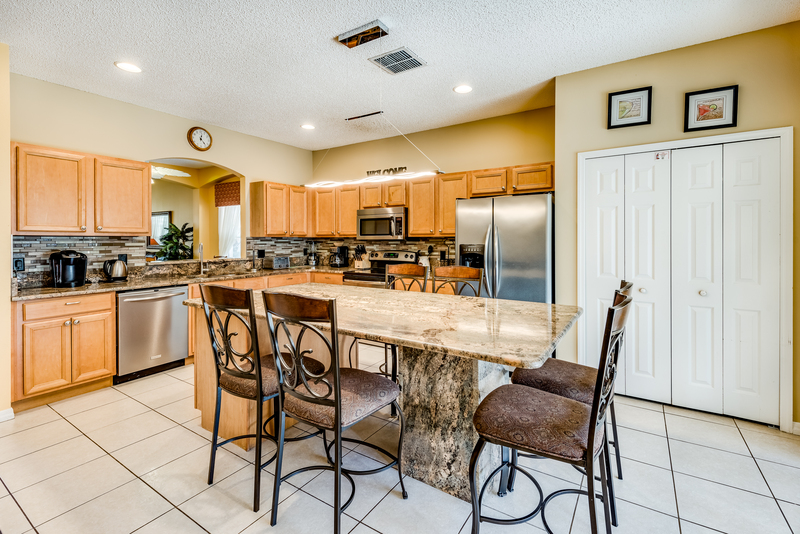 To start off, this kitchen has an oven and a cook-top stove to make special meals of your choice and is complemented by a refrigerator with freezer, microwave oven and automatic icemaker. 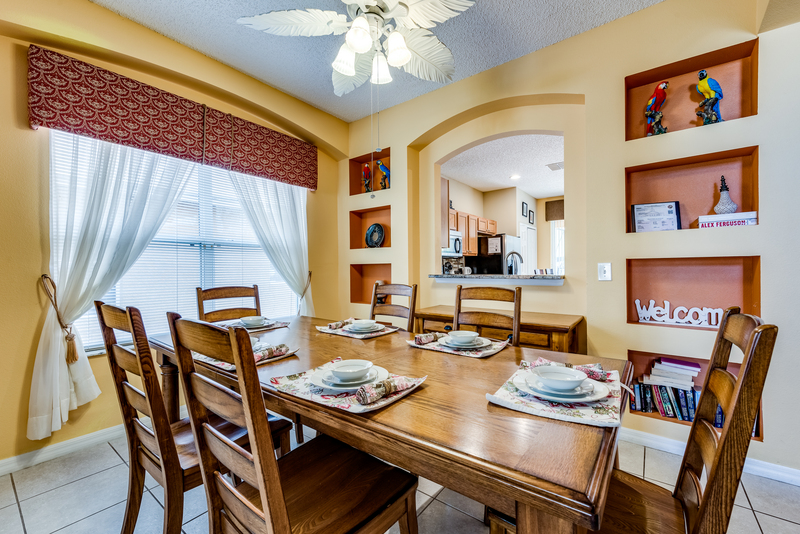 This kitchen is “complete” with dinnerware, silverware and glassware settings for 14 (including wine glasses), kitchen towels and oven mitts, knives and cutting board. There are plenty of pots and pans, baking sheets, microwaveable dishes. 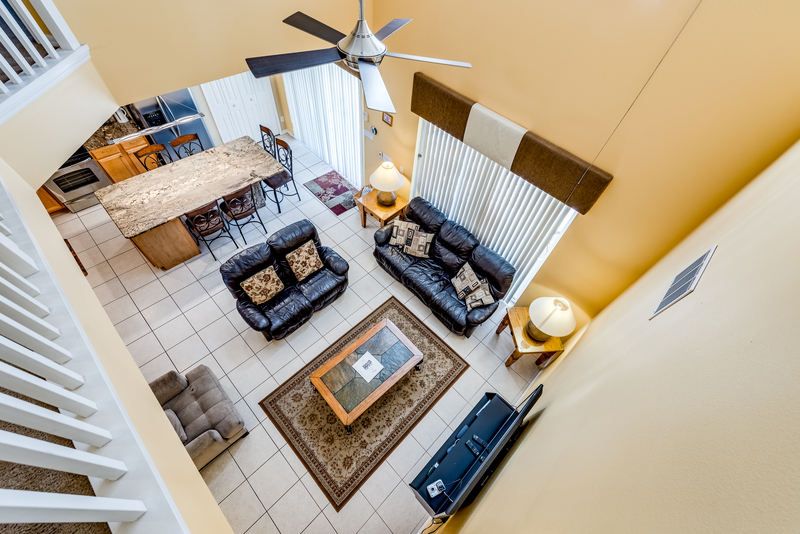 This King Master Suite is located on the first floor with a nice view of the pool and lanai area and has an en-suite bathroom with Jacuzzi, shower and separate toilet. 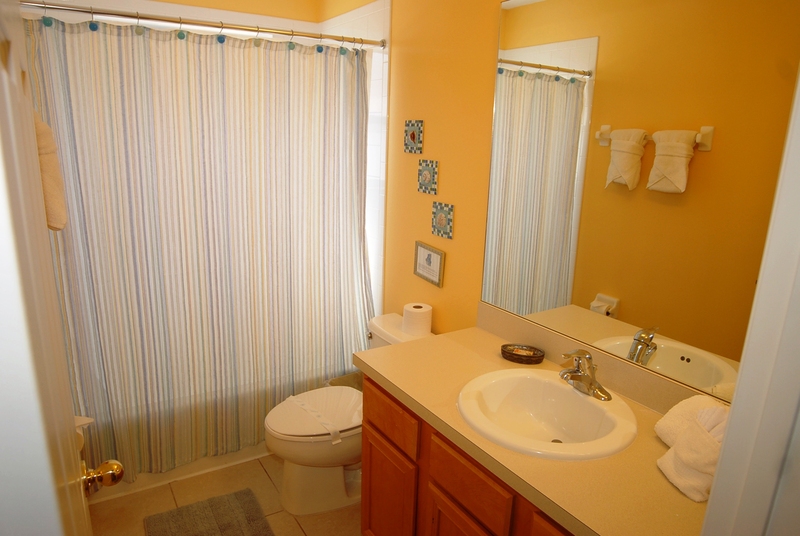 It is complemented by a huge walk-in closet. 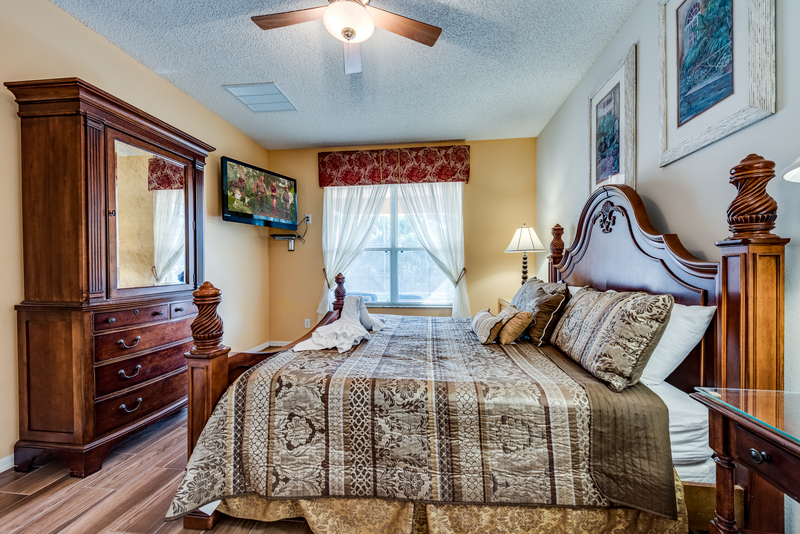 This bedroom also has a 32" flat screen TV with cable and DVD player. 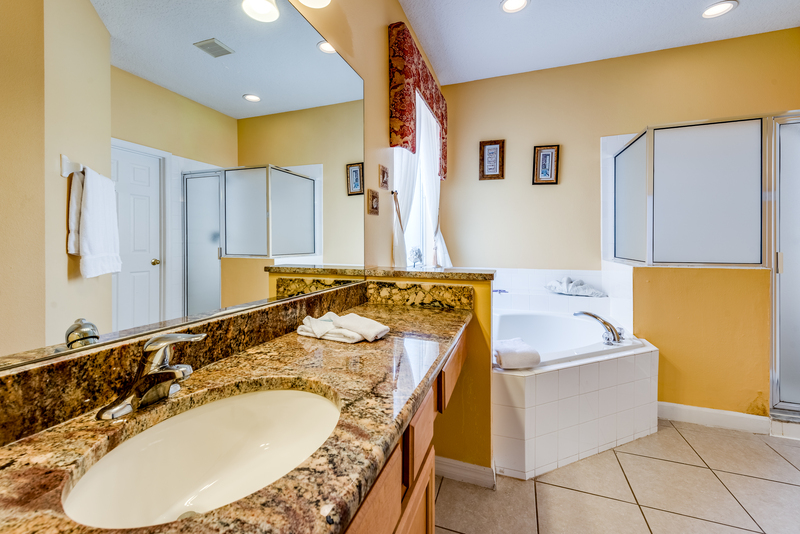 This King Master Suite located upstairs and has an en-suite bathroom with a tub and toilet. 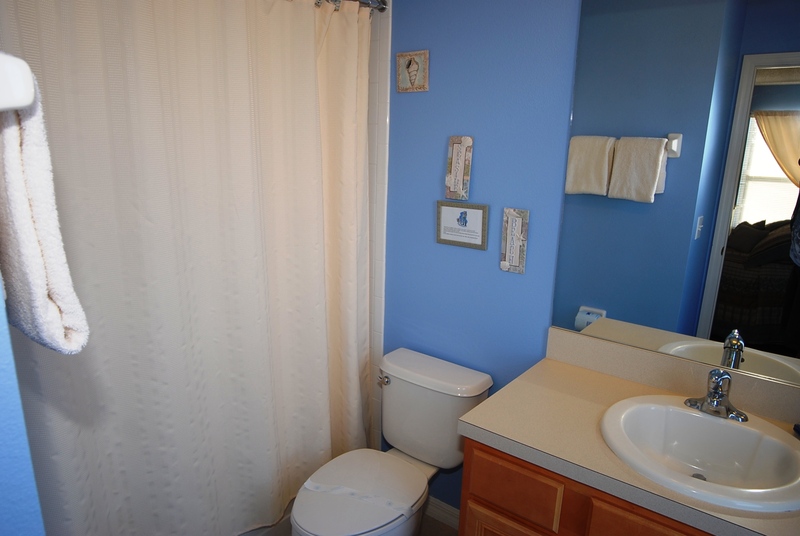 It is complemented by a huge walk-in closet. 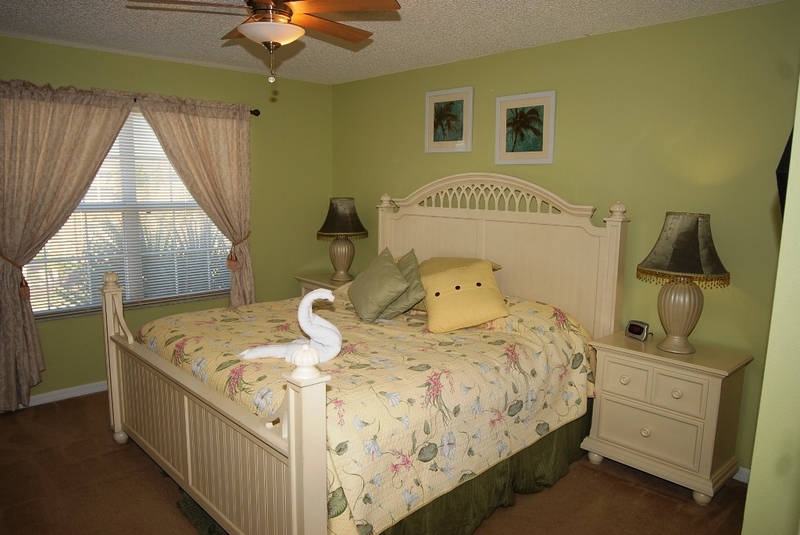 This bedroom also has a 26" flat screen TV with cable and DVD player. 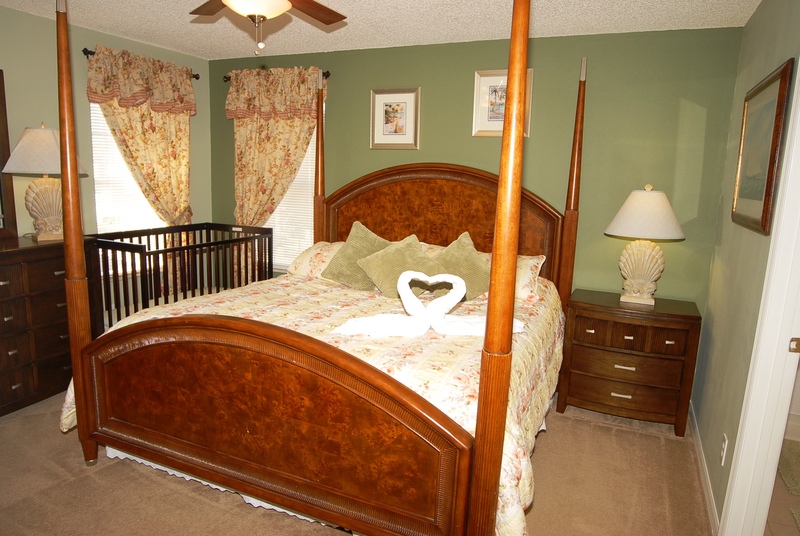 This bedroom has a full-size crib. 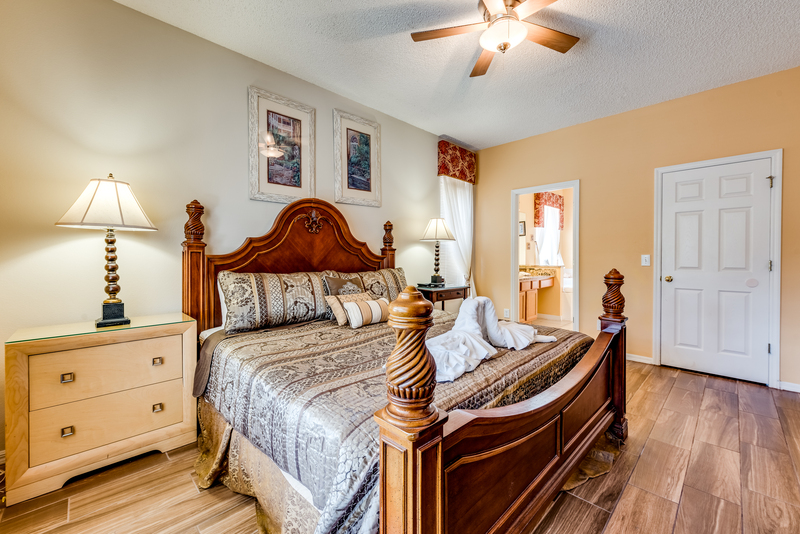 These King Master Suites are located upstairs and each has en-suite bathrooms with tub and toilet. 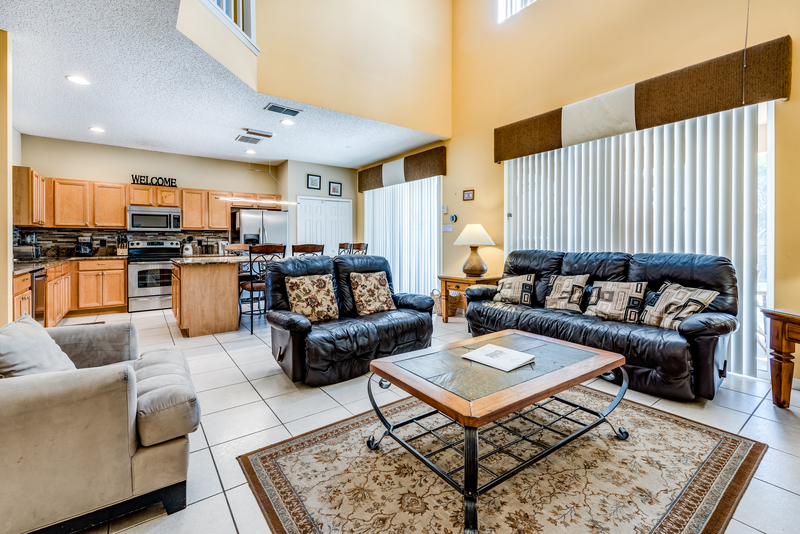 Both these bedrooms also have a 26" flat screen TVs with cable and DVD players. 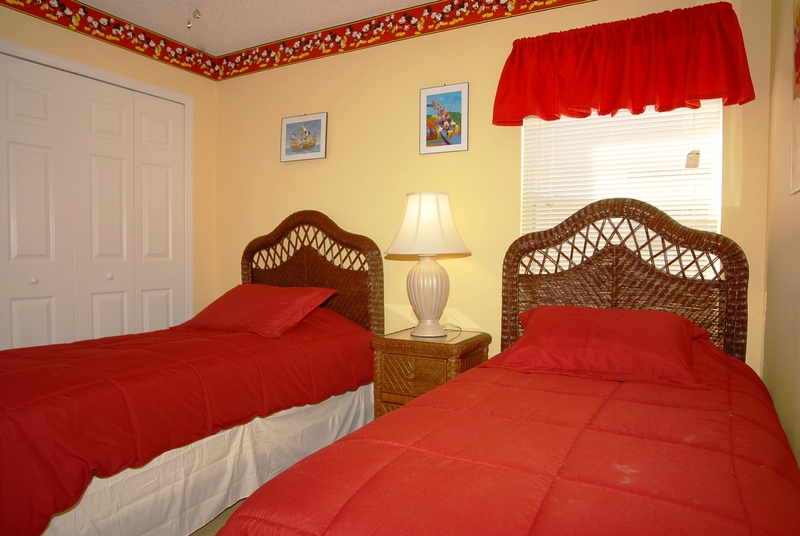 This "Mickey" themed room is decorated to high standards and has two twin beds that accommodates three kids. 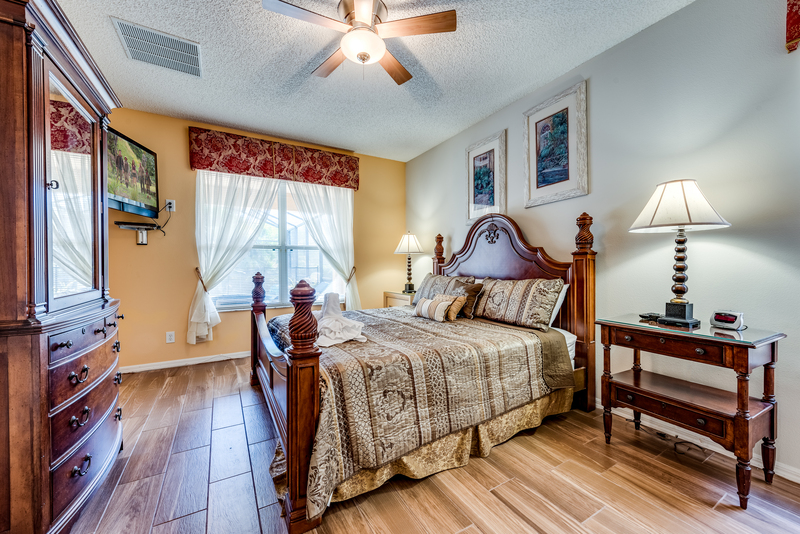 This bedroom also has a 24" flat screen TVs with cable and DVD player. 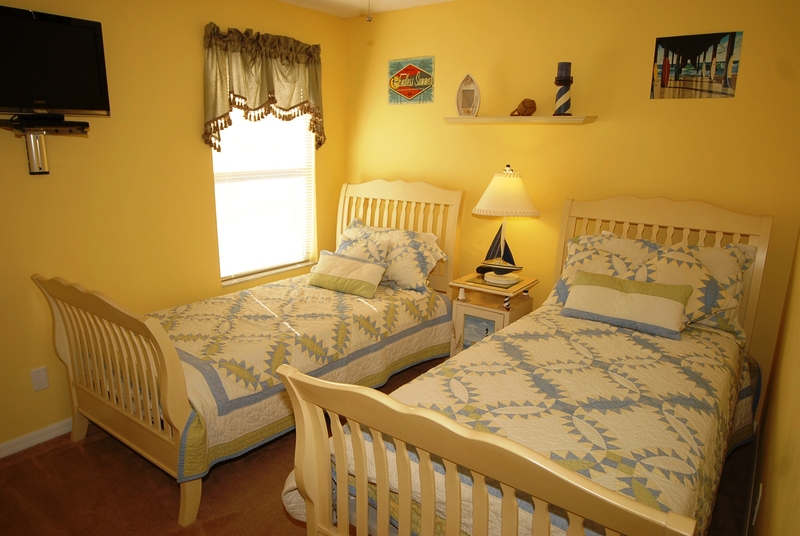 This "Beach" themed room has two twin beds that accommodate two kids. 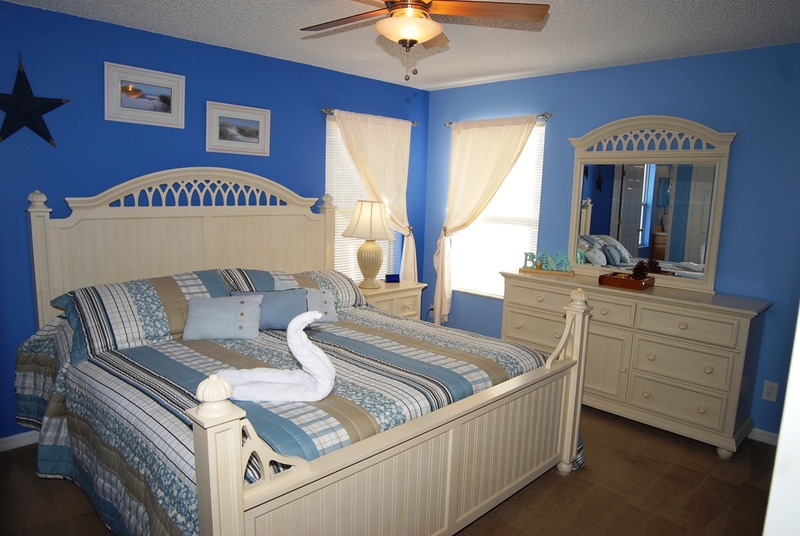 This bedroom also has a 24" flat screen TV with cable and DVD player. NOTE: We prefer Sat-Sat bookings. All reservations that are not Sat-Sat are accepted on a case-by-case basis. Christmas and/or New Year bookings require a minimum of 14 nights. Note: There is a sleeper sofa in Living Room to accommodate two extra guests if required. 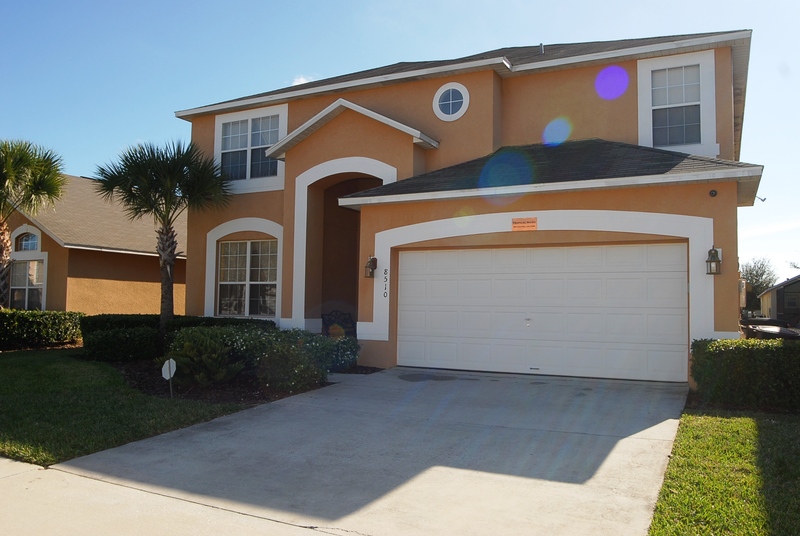 We rent every year in Emerald Island - the process is easy, the gated community is superior and is a decent location to get to pretty much all attractions. This particular house was better than most that we rented. 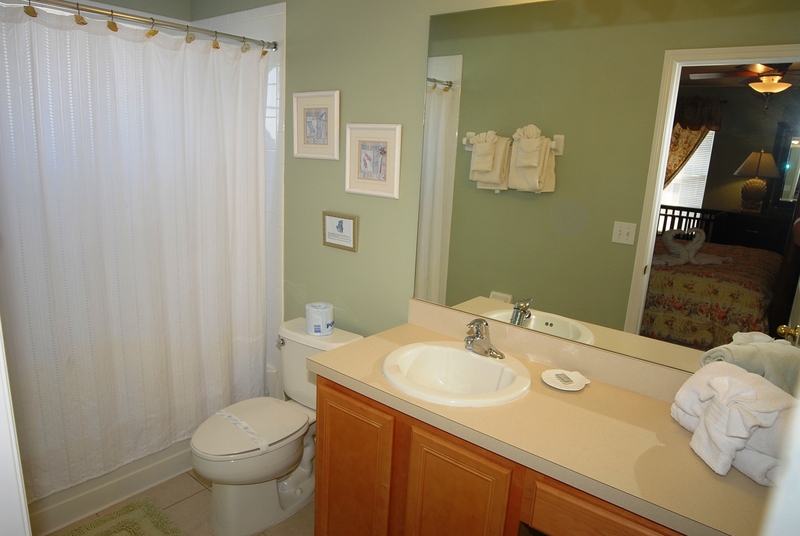 One recommendation - take out all the carpeting!! It would be much cleaner!! Cleaning services could be better. Property Management company for this villa was spectacular and better than others from past years.